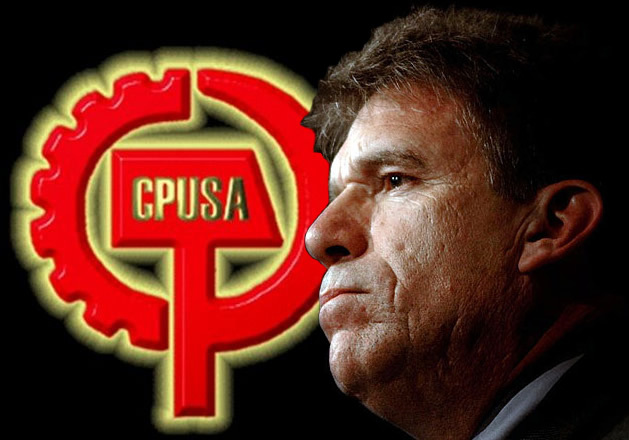 Minnesota Secretary of State Mark Ritchie is regarded as a "non-party friend" by the Communist Party USA. 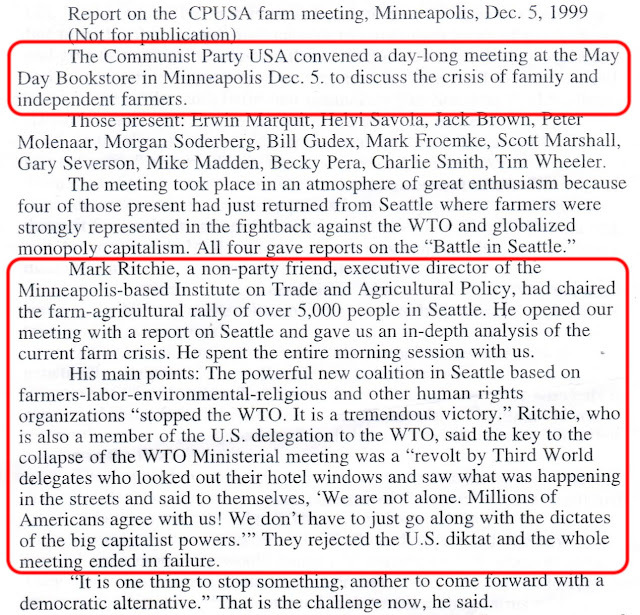 So highly does the Communist Party regard Mr. Ritchie, that he has been allowed to attend an high level "not to be publicized" Party meeting in Minneapolis. Some of the Communist Party members at this meeting, later supported Ritchie in his Secretary of State election campaigns. One of them, labor leader Mark Froemke, went on to support two of Ritchie's Democratic - Farmer - Labor - Party colleagues - Al Franken and Mark Dayton in their respective election campaigns. As Minnesota Secretary of State, Mark Ritchie's job includes overseeing the State's electoral recounts. In 2009, following a very controversial recount, Ritchie awarded a U.S. Senate seat to Al Franken. Currently Ritchie is overseeing another recount which could give Mark Dayton the Minnesota Governorship. Note in the first scan that Mark Ritchie is named as a "non-party friend" an honor bestowed only on the most trusted and respected of Party allies. Ritchie was allowed to spend the entire morning of an important Party meeting, addressing comrades from all over the U.S.
Ritchie and three of the Communists had just returned from the "Battle in Seattle" - the mass riots that broke out around the World Trade Organization meeting in that city. Though he was an official U.S. delegate to the W.T.O. meeting, Ritchie gloats that the rioting and protests "stopped the WTO," and that "It is a tremendous victory". Ever the skilled propagandist, Mark Ritchie then advises the Communists on how best to present their message - to use the more emotive term "food" rather than the harder sounding "agriculture". Mark Ritchie points out a target for activism, the proposed merger of Agri-giants "Continental" and "Cargills". Next, Chicago based Communist Party USA Labor Commission chair Scott Marshall raises the issue of agribusiness nationalization. Minnesota/North Dakota based Mark Froemke gives the example of so called successful socialist agri-enterprise, North Dakota's state owned grain elevators. A suggestion is made to use this example in a future article in the Communist Party USA's newspaper, Peoples Weekly World. "Karl Marx, Frederick Engels and V.I. Lenin devoted much study to the "agrarian question." To prepare this report, I read for the first time parts of Volume III of Capital. "This natural productivity of agricultural labor (which implies here the labor of gathering, hunting, fishing, cattle raising) is the basis of all surplus labor," Marx writes. "So is all labor primarily and originally directed toward the appropriation and production of food. Originally, agricultural and industrial labor are not separated. The second joins the first." For Lenin, the strategy that underlay the Russian Revolution was the alliance of workers and the poor and landless peasantry. In the U.S., for much of the past century, the strategic goal of left and progressive movements was the creation of a Farmer-Labor party." Next came discussions of a march on Washington D.C., by the same coalition that had "staged" the "Battle in Seattle". Niel Ritchie, (spelt incorrectly in the report), Mark Ritchie's brother is also revealed as a Communist Party contact. Niel Ritchie is now a leader of the League of Rural Voters. The document is signed by former People's Weekly World editor, Baltimore/Washington State based dairy farmer Tim Wheeler - son of Donald Niven Wheeler, a communist and once a Soviet spy inside the World War 2 Office of Strategic Services. Mark Ritchie's ties to the Communist Party USA did not end there. In 2006 and 2010, Erwin and his wife, Doris Marquit donated to Ritchie's Secretary of State campaigns. In 2006 Erwin and Doris Marqit, Peter Molenaar and Mark Froemke were all listed as Mark Ritchie campaign supporters. Mark Froemke also went on to support Mark Ritchie's colleagues Al Franken and Mark Dayton - Ritchie, Franken and Dayton all serve on the advisory committee of Wellstone Action. In 2008 Mark Froemke's Bakery, Confectionery, Tobacco Workers and Grain Millers Union, Local 167G, endorsed Al Franken. 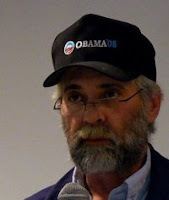 In October 2009, Mark Froemke was the Fargo Moorehead organizer for a 10 Days of Labor Action campaign for Minnesota gubernatorial candidate Mark Dayton. Froemke did more work for Dayton in 2010. The pair were apparently very close as demonstrated by the Froemke/Dayton "manhug" shown in the January 2010 photo below. The Communists were well aware that their Democratic allies, desperately needed Franken's 60th seat in the Senate. This was the "magic number"required to ensure that "progressive" legislation, such as the pro-union "Employee Free Choice Act" could be passed without the inconvenience of a Republican filibuster. In the Communist Party's People's Weekly World, November 22, 2008, labor journalist Barb Kucera wrote an article, Minnesota euphoria over Obama win tempered by Senate recount, which quoted both Mark Ritchie and Mark Froemke . "Whether Minnesota labor's massive effort to mobilize members in the 2008 elections was a success will ultimately turn on the results of a recount in the U.S. Senate race, Labor 2008 coordinators say. 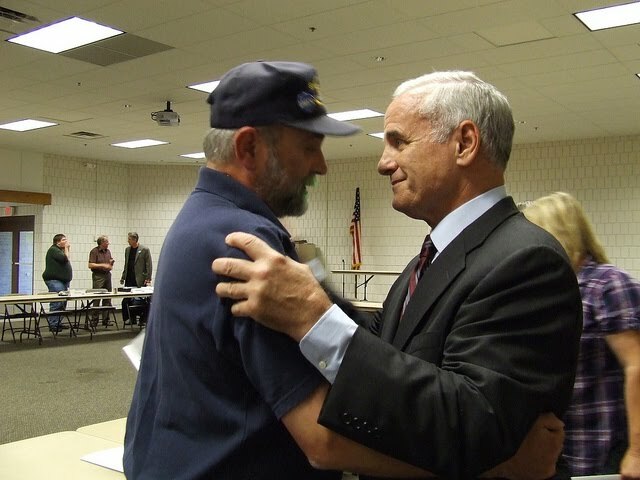 While most AFL-CIO and Change to Win unions backed Democratic-Farmer-Labor (DFL) challenger Franken, a few labor organizations–notably the Carpenters and Pipe Trades--endorsed Coleman. After all the results were turned in, Coleman led Franken by only 215 votes out of just under 3 million cast. An official recount began Nov. 18 and could take a month, Secretary of State Mark Ritchie said. Independence Party candidates made the difference in the Bachmann and Paulsen races and definitely affected the Senate race, said Mark Froemke, president of the West Area Labor Council that spans the western half of the state. 'The Independence Party got a better number than I would have expected in this area,' he said." Clearly the Communist Party USA supports at least some sections of Minnesota's Democratic - Farmer - Labor Party. In particular the Mark Ritchie/Al Franken/Mark Dayton faction. It is also very significant that the Communist Party USA , an ultra secretive and highly paranoid organization, trusts Mark Ritchie enough to admit him to an high level secret ("not for publication") meeting. Mark Ritchie, the Communist Party's "non-party friend" was tasked with overseeing both elections. The integrity of Minnesota's voting system depends on it. Reposting. Thank you, Trevor. Great find!!! Most likely his "non-Party friend" status is really code for secret Party member. Good work Trevor. I know you have the ability to influence Glenn Beck.I would ask You to see if You can interest him in this Mark Richie story,it should easily tie in with his coverage of George Soros and his SOS Project.Communists is a word I hardly hear from Glenn Beck,Hannity,or Rush.They damn sure have out ear but these commies are HIDING IN PLAIN SIGHT.Sad. Jim. As Ritchie has been on the CP radar, since the '70s, i wouldn't be surprised if you are correct. Larry. Glenn beck picks up a lot of my material. hopefully he will pick up the Ritchie story. I would also like to plead to Glenn to pick up this story on Ritchie. It's important for people to understand that these communist empathizers have gotten themselves into positions of power within our government and are pretending to be "mainstream" but have an agenda which is much, much darker. Once again, nice work, Trevor. Thanks for all the work you've done to uncover the truth in America. And I must acknowledge that it was Becks site that linked me here to yours.This is one of my MUST view sites each day.Anyhow I must believe,"we shall overcome". The meaning of non-party friend in a CPUSA classified document is clear - it means Communist infiltrator. One infiltrator exposed, now let's see if our end can stop him from completing his task. One of the KeyWiki videos came back to mind, "Frances Fox Piven: "We Got Obama - that's not bad at all" "
The CPUSA has been doing a great job of getting things done under the radar.